Hello, hello, hello. As promised I am back to blogging regularly and today I bring you something I haven't done in a while, and something I've never done in this style, a wishlist, it was actually pretty fun to make a wishlist in this style. The background photo is mine too. 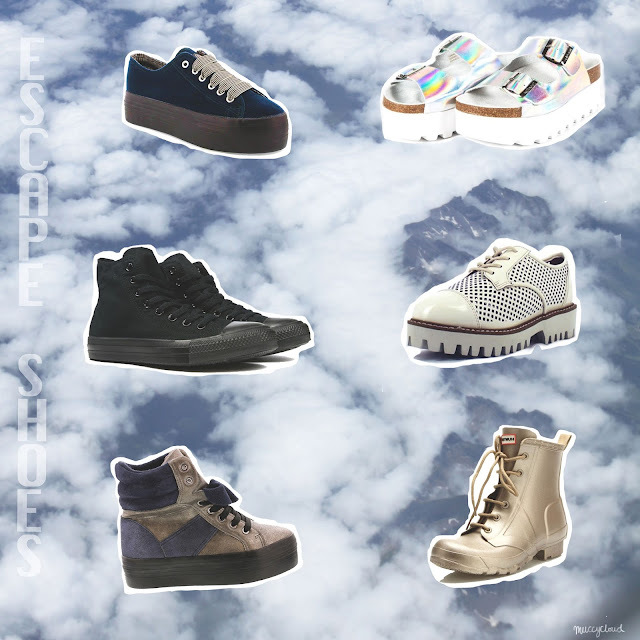 Today's wishlist features some shoes from EscapeShoes, they have some really cool shoes from some really cool brands, my fave (and newly discovered) has to be Sixtyseven. I liked pretty much every pair of Sixtyseven shoes on there. I added some sandals and some really cool wellies because summer is coming up so beach and festival shoes are needed. The numbers go left to right, top to bottom. EscapeShoes also do free shipping to quite a few European countries for orders over fifty euros, and free shipping is always a good thing. I'm pretty impressed with how this came out considering it was a first try. Also I should be back next week with a new post as my exams are over this Thursday. I am honestly so excited, I've done 12 now and I only have one left. Though the exam I did on Friday was the most evil thing I have ever seen, but everyone thought that so it should be ok! And today's was pretty nice. There will be a post with a video sometime next week and it's all a bit of a surprise. Unless you have seen me talking about it on my other social medias... so not too much of a surprise to some, aha. I hope all of your weeks are going well! And that you enjoy this post, see you soon. You have seriously awesome taste in shoes. Hope your last exam goes well and freedom comes soon! What a fun selection of shoes! I just love the classic black Converse high tops.